The story of the Road to Emmaus is probably my second favourite resurrection appearance – after Mary’s recognition of Christ in the garden. I can place myself both in the pain and grief of the two walking away from Jerusalem; and in their joy at the moment when Jesus reveals his identity to them. It also provides us with an encounter with Christ that we can emulate when we break bread and drink wine – as we’ll be doing later this morning. One of the things that has surprised me about ordained ministry is how easy it is for people to not recognise me when I’m not wearing my dog collar. Even more so if I’m wearing especially casual clothes, on my way home from the gym for example. (Or at the gym!) We all struggle with recognising people out of context. Even more so when we simply don’t expect to see that person – like the time I saw an old friend on the tube, who, as far as I was aware, was living in Singapore! Jesus was the last person the two men on the road to Emmaus expected to see. He was dead. They were grief-stricken. Their hopes had been dashed. They’d witnessed the brutal killing of the man they’d believed was their messiah. No wonder they didn’t realise who Jesus was! But the revelation of his identity was saved for a particular moment. At the Last Supper Jesus had called his disciples to remember him in bread and wine, using the words that we hear every time we receive communion – this is my body, this is my blood… But in Emmaus, it wasn’t remembrance that took place, it was revelation. I don’t know how much time you’ve spent thinking about how you might go about telling people about Jesus and the message of the Gospel? Perhaps you’ve been involved in an Alpha course, or suggested that someone else do it? Or lent someone a book? Or been alongside someone in their darkest moments and offered to pray? There’s countless courses and books out there designed to train us as evangelists, as sharers of the good news, and revealers of Christ. But something that the Road to Emmaus narrative tells us is that sometimes revelation happens without any of those things. Instead, Jesus a moment in which to reveal himself. 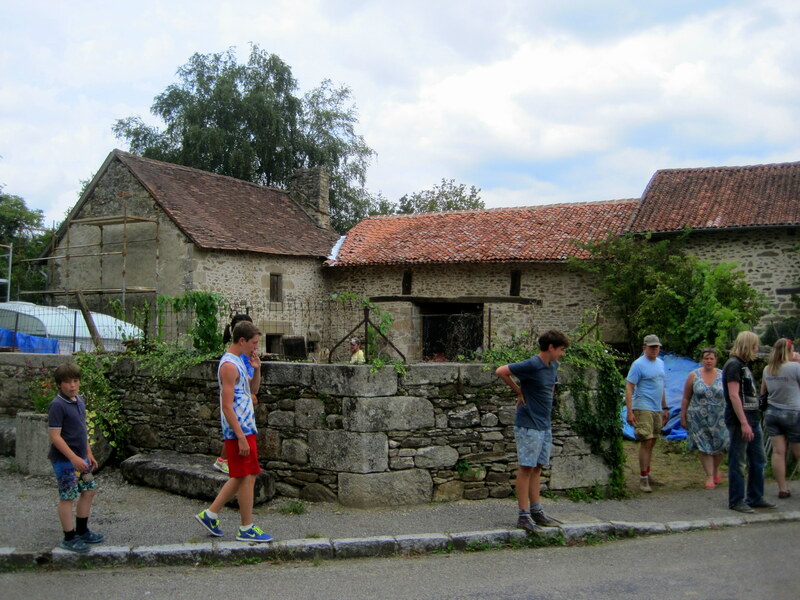 Some of you are aware that once or twice a year I go on holiday to France in order to work with friends to renovate an old farmhouse. In fact, I just returned from our latest trip on Tuesday. We’ve been going for nearly 7 years, and the initiative is managed by the missional community of which I’m part. 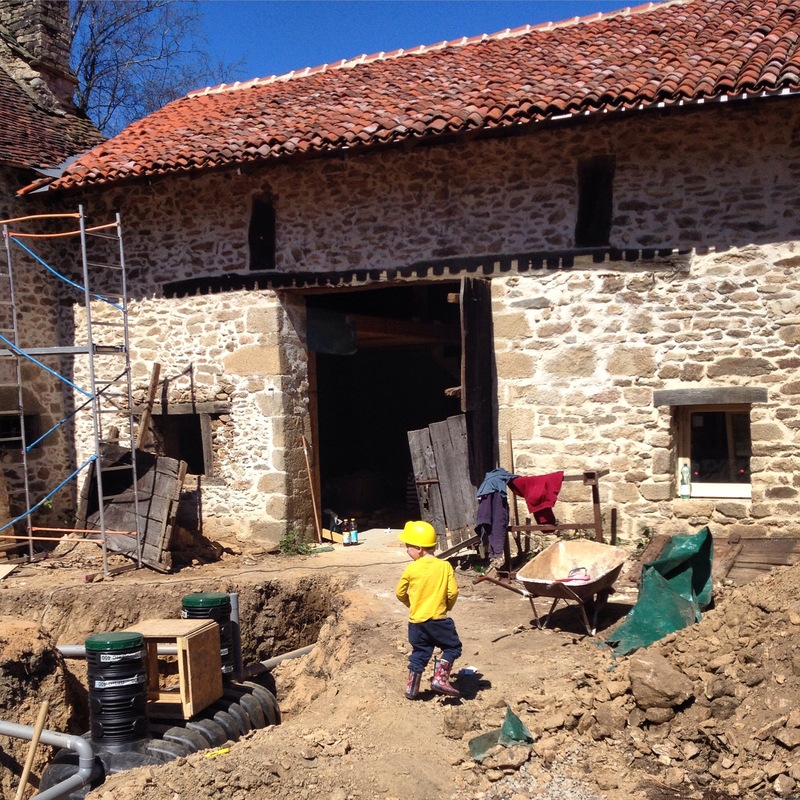 Over 13 trips, around 80 adults from the UK, US and a handful of other countries have helped turn a tumble-down barn into a space that – as of last weekend – can now be inhabited. One of the main features of our community is an open-table meal at our building in Limehouse every Thursday evening. When in France, the gathering around a large table is the focus of every evening. It’s no mean feat cooking and seating 20-30 people in one go! In London, these meals are a place where relationship is built week upon week. There isn’t any explicit Christian content, apart from a prayer before the meal, but it has become a safe place for some who are exploring their relationship with God. In France, we often only have a few days in which to build relationships with those from places other than London, but the same principles apply. 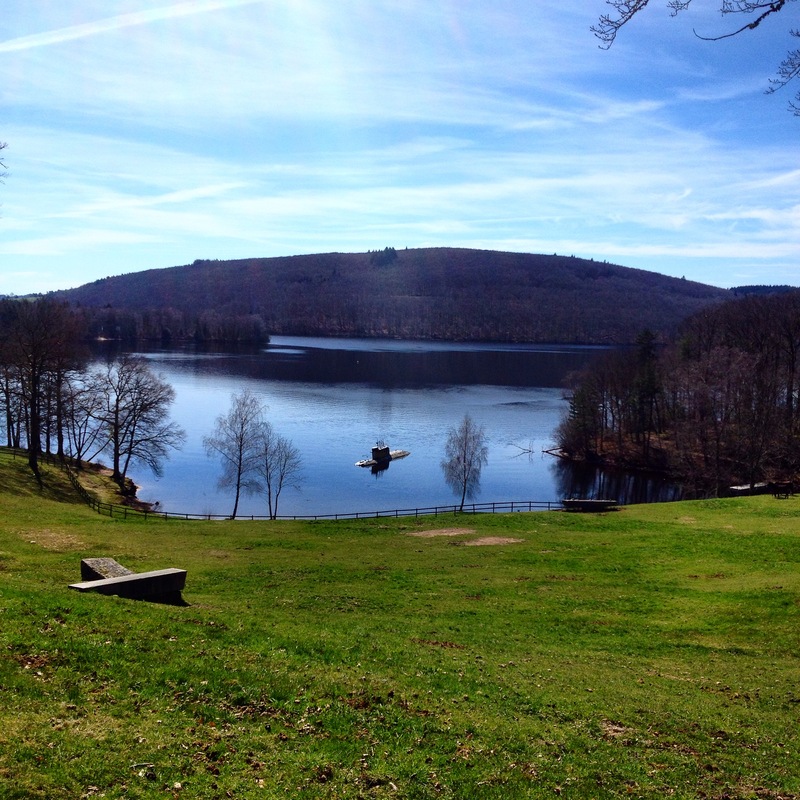 “It’s hard to explain the community-building work you’re doing through Chateau Duffy, but it seems to me a bit like that walk along the road to Emmaus. Strangers come together, get a little dusty, and talk about the things that matter most – by which I mean both their personal concerns and life’s biggest questions. Jesus is there in those conversations, but he’s not jumping up and down saying, “Hey! Look at me!” He seems rather to content to follow the road, and to let it—and the conversations—lead where they will. But then there are these moments, and of course they tend to happen around a shared table, where something more is revealed, and deeper connections are made. I thought about the conversations atop of a scaffold rig on a hot summer’s day, discussing relationships while trying to make mortar stay in between stones. I remembered the late nights staying up drinking good whisky and getting to the types of conversation that only ever come up when you’ve been drinking good whisky! I remembered the American interns who returned home with a new appreciation of what a diverse community can look like. I think of atheist friends who’ve found a welcome and a place in which questions could be asked. 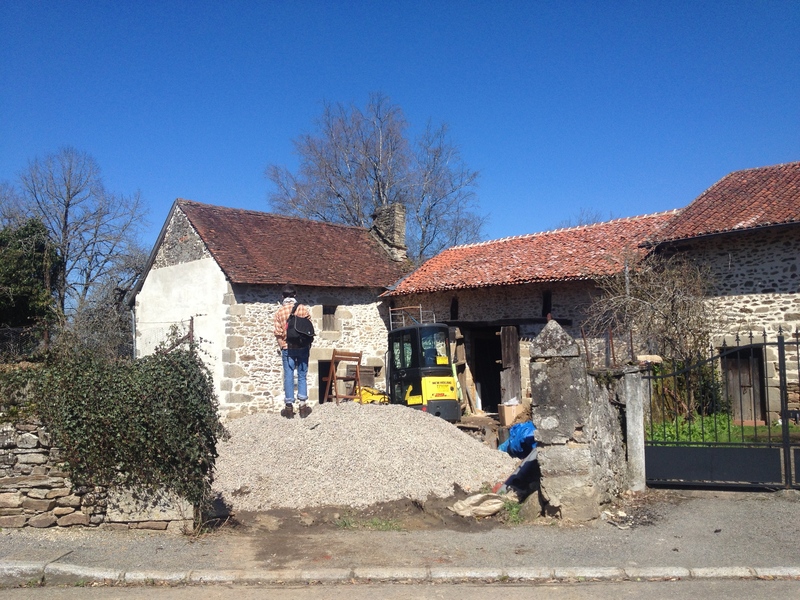 I think of the friendships which are deepened purely because we shared a week in a gite together, and have some brilliant stories about the ridiculousness of learning to tile a bathroom. And I marvel at the deep friendship formed with a British family who live around the corner from our house, in this tiny village, who have opened their home to us time after time and who are now a firm part of our family. We’ve been practising hospitality through meals for years, and if you asked me or Shannon (who founded our community) what our theological objectives were, I’m not sure that we would have articulated them as clearly as Jim managed to after his trip to France. But, the more I’ve reflected on this passage, the more I see it as a calling to all disciples of Christ to give him the space in which to encounter those who have not recognised him for who he is. I believe that we have a role to assist in Jesus’ revelation to others. After all, in our passage today, the two men tell Jesus the story of his ministry – but it is Jesus who provides them with the other half of the story, the prophecies that have been fulfilled, and the all-important punchline of realisation. It brings me back to thinking about communion. Every time we share in the bread and wine here, we re-tell the story. Each Eucharistic prayer tells the story of who Jesus is; what he came to earth to do; and of the meal he shared that last night with his disciples. Then we receive the bread and wine, a tangible reminder and a physical encounter with the body and blood of Christ. It’s then up to Jesus to do the rest – to fill in the punchline. Someone who has really inspired my personal theology of the Eucharist (which was the subject of the MA thesis I was finishing up when I arrived at Christ Church), is a woman called Sara Miles who lives in San Francisco. “One early, cloudy morning when I was forty-six, I walked into a church, ate a piece of bread, took a sip of wine. A routine Sunday activity for tens of millions of Americans – except that until that moment I’d led a thoroughly secular life, at best indifferent to religion, more often appalled by its fundamentalist crusades. This was my first communion. It changed everything. Eating Jesus, as I did that day to my great astonishment, led me against all my expectations to a faith I’d scorned and work I’d never imagined. The mysterious sacrament turned out to be not a symbolic wafer at all but actual food – indeed, the bread of life. In that shocking moment of communion, filled with a deep desire to reach for and become part of a body, I realised that what I’d been doing with my life all along was what I was meant to do: feed people. Sometimes, for Christ to reveal himself to others, all we need to do is to welcome people in and let Jesus meet them in that place – whether that’s communion; or a shared table; or a chance conversation; or any number of spaces in which revelation is possible. Firstly, how well do you recognise Jesus in the world around you? If you’re not sure, ask the Holy Spirit to open your eyes and reveal Christ to you. Secondly, where might you make spaces where Jesus can reveal himself to others? Inviting someone to a meal, or to church could be a simple action that leads to an encounter with Christ. Ask the Holy Spirit to encourage you and show you what to do. First of all, it’s not a chateau. We’re aware of that, but it does confuse people. Our current Matryoshka Haus interns had to explain this fact to their rather excited American families. What can I say, we’re eccentric English people! In her defence, she was not wrong. She just left out the hours of back-breaking work that would take place before we had a moment to jump into the pool or open a bottle of red! Anyway, as long-term readers of this blog will know well, by the end of that trip I was fully committed to the project that was now known as Chateau Duffy and was on my way to developing a wide range of DIY skills. Chateau Duffy in August 2011 before any work began. Taken down the barn’s roof. Rebuilt the barn’s beams; boarded the roof; waterproofed it & then put the tiles back. Dug up and concreted the barn’s floor. Dug up and concreted the house’s floor. Built a mezzanine in the barn. Built another mezzanine & created frames for two bathrooms. Added a staircase to the barn. Dug out and installed a septic tank. Mortared the internal walls in the barn. Painted window & door frames. Installed (some) windows and doors. Re-tiled the house roof (with some help from Romanians). Connected the water supply to the bathrooms. Installed toilets & shower trays. Dug out trenches for laying pipes. Pointed some more (mostly inside). You’ll notice some recurring themes… My goodness pointing is a never-ending task! Despite that looking like an epic list, we’re still not done. Sure, you can use a toilet and potentially have a shower but you can’t yet cook a meal. But all that could change by the end of July! I feel like this photo from April’s trip doesn’t quite do our work justice – you can’t see the inside and the endless pointing efforts are less obvious from a distance. Despite still being a bit of a way off finishing, the amount that’s been achieved in a little over 12 weeks is pretty impressive. Our local builder friend even suggested that we’d got more done in three months spread over 6 years than a team might have managed in 12 consecutive weeks. (Although I’d be inclined to suggest that it’s largely French bureaucracy that would hold things up! Should you find yourself at a loose end for the last week of July, there’s still time to book! In my defence, I had been asked to complete a form that shared some information about myself with the Bishop. What did I enjoy doing in my spare time? What hobbies did I have? There was even an instruction to be a little bit different. 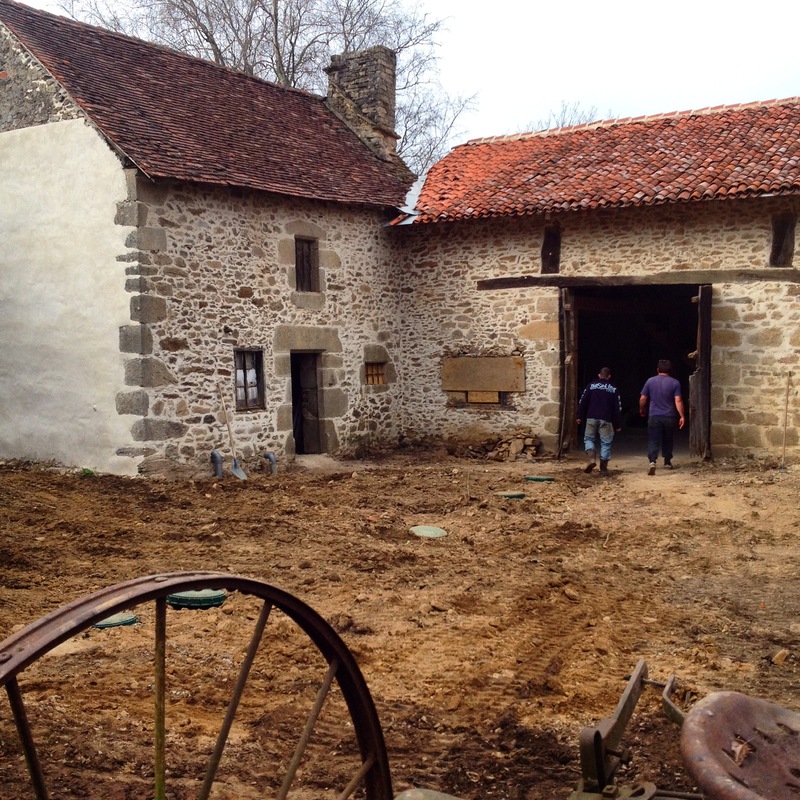 So I shared my hobby of house renovation in France, complete with the acquisition of the skill of cement mixing. And thus, I became “the lady cement mixer”. Lady cement mixer at work. The stuff gets EVERYWHERE. It’s embarrassing. Not because I am in any ashamed of my Chateau Duffy skills, but because there are probably people who heard the Bishop’s words and thought to themselves: “How wonderful!! Not only was a woman working on a building site, but she then felt a call from God and is now ordained! Fantastic. London is such a diverse church! !” When in fact the truth is that a terribly middle class woman has some slightly odd hobbies – hobbies that actually, she shouldn’t tell churches too much about, because otherwise they’ll want her to start fixing things! Perhaps I shouldn’t be quite so embarrassed by the Bishop’s fascination with the female ordinand who can mix cement. After all, how many people do you know who can mix cement? How many of them are women?? Do any of them do it for fun? My efforts in the trench even earned me a trophy! I work hard because it’s fun. I love a challenge. I want a place to go on holiday to in the future. And, because I really like the novelty of being a female vicar who knows her way around a building site. It’s not so much “This girl can” as “this lady vicar can”. Can, does, will and LOVES it. Watching a lot of Mary Berry baking shows has provided me with an encyclopaedia of cake based knowledge, much of which I haven’t put into practice. But I do whip it out in conversation every so often, which can result in me having a better reputation for my baking than might otherwise be deserved – although, when the chips are down, I can generally bake a pretty good cake. I can only imagine that it was a conversation along these lines, around a table with much vin rouge at Chateau Duffy this Easter, that resulted in my friend Helen making a request. Helen lives in St Denis, and was bemoaning the lack of English cakes locally – the kind that in Britain, you could pick up from a bake sale or local WI stall or even a local bakery. Yes, France does choux very well, but sponge? Not so much. Add to the mix the fact that Helen’s oven is a range (which Mary Berry has taught me does not do temperature consistency very well), and it becomes tricky for her to bake them herself. So, apparently, I offered to bring her a cake the next time I visited – and promptly completely forgot all about it. The cake caused a little consternation on Facebook. Was I really intending to travel all the way from Highbury, via Eurostar, an hour’s walk in Parisian rain, an SNCF train and then car to St Denis?? Yep. Did I think it would make it intact? Well, if it did, it would be a bonus! Upon presentation of the cake, I was given a pair of sandwich tins and I trotted off having promised to make another one in our gite’s decent looking oven over the course of the next 8 days. Inevitably, I got distracted by fun, mud and more fun, until it was our last whole day and I realised I still had cake to make. Oh, and it was someone on the trip’s birthday, so obviously a cake was needed for him too. I set off to make two Victoria Sponges. A cake I can make confidently and quickly – I had everything I needed (apart from the moment when I realised I’d forgotten the baking powder and then had to make an emergency trip out for more). I used the ratio of baking powder needed for our plain flour in the UK and put the first two layers in the oven where they rose, and went golden…and then sank. Horribly. I was peeved, but perhaps someone had opened the door to peek in & let in cold air? I’d have another go with the next cake. But the same thing happened again. This, my friends, is not something that deserves to have Mary Berry’s name anywhere near it! In fact, it ranks as probably the worst cake I have created since I was 9 years old. Brilliantly, by this point in the day, I was actually quite relaxed about the whole thing. [Previously, I have been known to throw cake disasters onto the floor and stamp on them.] In fact, it was with laughter that I drew a couple of people into my hideaway to get their response – which was effectively gales of laughter. The trench – pre pipe laying. If ever there was a cake that could possibly be something akin to a GBBO showstopper, this was it – but in true Chateau Duffy style, it was somewhat ramshackle; things had escalated slightly out of control; and nothing had really gone quite to plan. Still, served in semi-darkness with a bunch of candles on top of it, it served its purpose. And, in the words of a 7 year old present: “Liz, this cake is really tasty” – so at least it was edible, which is the most important thing. The lesson learned from this experience? Do not rest on one’s baking laurels. A different oven is a bad enough risk, let alone a different country, complete with language barrier and foreign flour. There really is only so far Mary Berry can get you. Chateau Duffy at the end of the August 2014 trip. 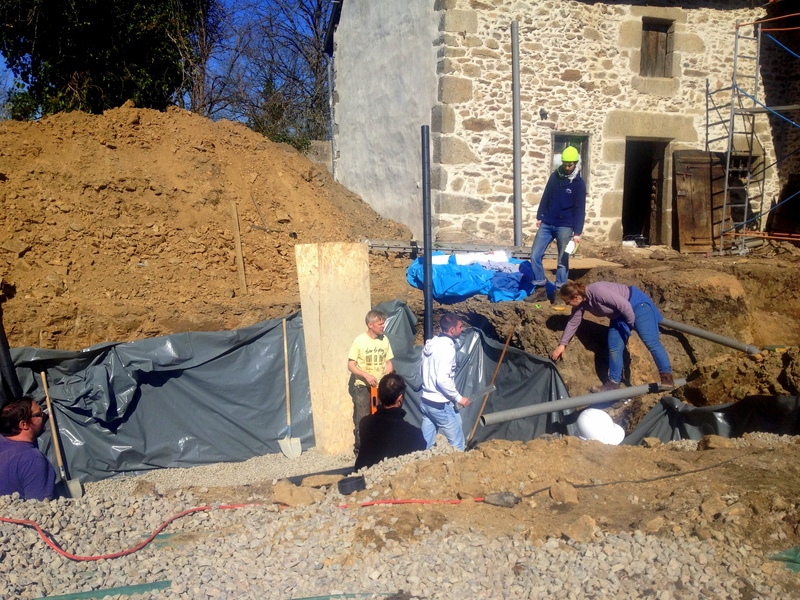 Last week Chateau Duffy VII took place and the primary aim was to get the approval of “the SPANC man” for the chateau’s septic system. The groundwork for this had been laid – or rather, dug up – by our team’s local member, who lives just a few metres up the road. His wife’s Facebook posts chronicled the digging of a hole of such proportions that seemingly everyone in the region knew about it. Upon our return in April 2015 (after the advance party had already been at work, plus Will’s efforts). “Mike’s hole” (as it inevitably became known, once our long-suffering plumber took up residence at its bottom) was the primary focus of the trip. It couldn’t have been anything but that, given that it basically took up the whole of the site! Most of us were involved in work on/in it at some point – even our smallest team member helped add gravel to it at one point. Only in France would a septic tank inspector turn up in a white hoodie. The hole brought with it many trials and tribulations. It turned out very few of us had any real idea of what a septic tank involved, and that the SPANC man had some very specific ideas about what was needed! Much joy was exhibited on Wednesday afternoon when he made his third visit and finally proclaimed it acceptable. In the mean time, progress was being made inside. While we were away, Will had slurried the back wall of the barn. 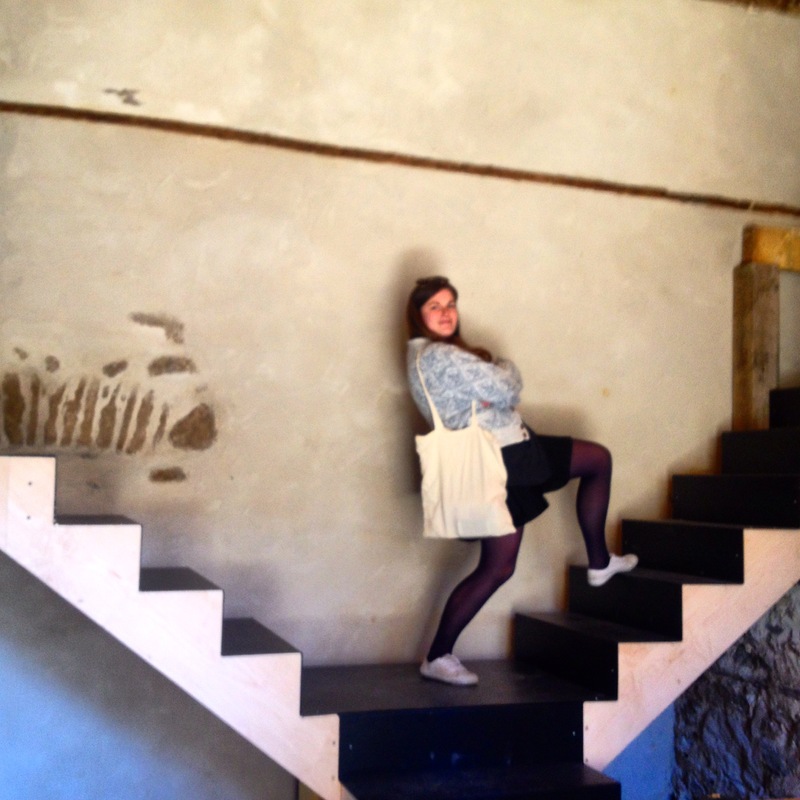 In the couple of days the ‘professionals’ had on site prior to the amateurs getting involved, they put in stairs – fancy, Duffy designed stairs no less! As the hole took shape, last summer’s second mezzanine was completed and floored. Those of us in “Team Caz” (we had huddles, a motivational song & an over-developed sense of team pride) took charge of mortaring. Internal walls were topped with cement smoothed level enough for a coffee cup to sit upon (our very specific brief). The local residents had a rude awakening at 9.30am on a holiday as the sound of a cement mixer being towed down a hill disturbed an otherwise peaceful morning! What can I say? There’s reflection & a cross! Perhaps we won’t return until next Easter, but hopefully, now that the hole’s been filled in and we’ve scattered grass & wild flower seeds across the ground, the inhabitants of St Denis won’t consider the site to be as much of an eyesore as it has been over the last couple of months! Chateau Duffy, end of trip VII.